'When, as a child, I laughed and wept, time crept. When, as a youth, I dreamt and talked, time walked. When, older still, I daily grew, time flew. Soon I shall find, on travelling on, time gone ! Some lines written on a clock in Chester Cathedral, U.K.
You will find there, illustrations of Saturn and its fascinating moon ENCELADUS, thought to be a possible abode of life, as is Jupiter's satellite Europa. THE TWO QUADRANT CHARTS, updated twice a month are now to be found on the supplimentary FRONT PAGE also. SKYNOTES are available. 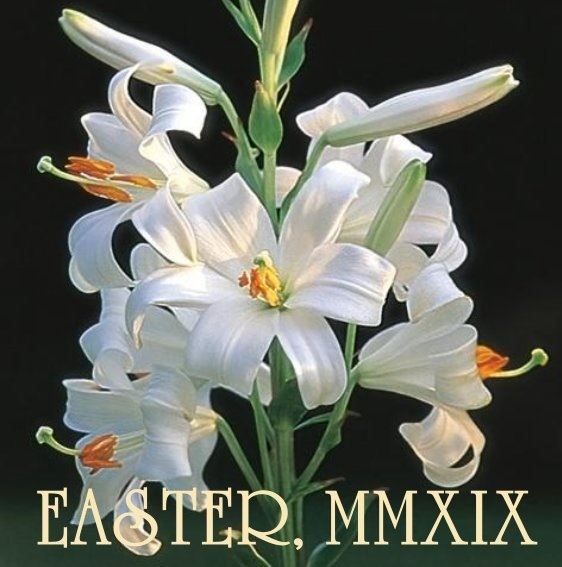 Use The MENU above for the APRIL, MAY 2019 and JUNE SKYNOTES. ADDED : ASTRONOMICAL POEMS PAGE: Please use the MENU to find this new page. ADDED also: A Theological and Astronomical Reflection upon the 'STAR OF BETHLEHEM'.Please use the MENU to find this page. ASTEROIDAL OCCULTATIONS for THE CURRENT MONTH accessible via the Menu above (ASTEROIDAL EVENTS). Thanks For those Andrej ! PATH OF ASTEROID (DWARF PLANET) 2- PALLAS accessible via the Menu above (ASTEROIDAL EVENTS). PATH OF ASTEOID (DWARF PLANET) 1 CERES accessible via the Menu above (ASTEROIDAL EVENTS). THE INTERNATIONAL SPACE STATION and IRIDIUM FLARE SATELLITES' VISIBILITY. For information about suitable times to see the ISS, other satellites, and interesting objects, and to download the application if you wish, go to the following admirable site: http://heavens-above.com"
The international Space Station has the appearance of a bright star moving across the sky from west to east. it is often around the same brightness as Jupiter, (the fourth brightest celestial object in the sky after the Sun, Moon, and Venus). The TIMES HERE ARE UT. When Summer Time is in force please remember to ADD one hour. 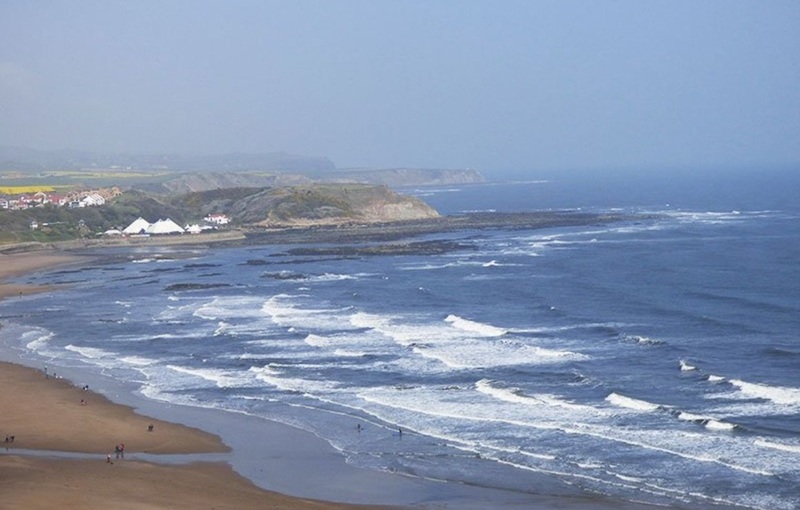 WELCOME to JONVRAN.CO.UK, John's simple astronomy site where you will find information about what is happening in the night sky from the point of view of SCARBOROUGH in the United Kingdom, Latitude 54 deg. 17 minutes NORTH, Longitude 00 deg. 25 minutes WEST,(Situated on the East Coast, midway between LONDON and EDINBURGH, and also Mainland Britain); as well as what I hope are other interesting bits and pieces, of use to everyone. You can contact me using the form in the CONTACT area, should you wish to do so. PLEASE FEEL FREE TO DOWNLOAD AND USE ANY OF THE MATERIAL FROM MY WEBSITE, WHICH YOU FIND USEFUL. THAT IS WHY IT IS HERE ! Historically, these 'Skynotes' are a direct cyber-descendent, of the paper skynotes I prepared, for many years, by hand, for members, at each meeting of the Scarborough Astronomical Society from the moment the Society began in 1976. In those days, I produced all the illustrations including the star charts by hand, but now, with the advent of excellent Astronomy software programs, I am able to use much better graphics, for which I thank the many programmers who have produced these wonderful software gems. In the CREDITS section you will find a list of these amazing sources that allow me to continue to produce my 'Skynotes', for the benefit of all. There are quite a number of 'pages' in this new version of 'SKYNOTES'. They are listed in the MENU at the top of the page. My hope is that you find within them something of interest, and may I, here, express my gratitude to the many people who have already visited, this, my small contribution towards the popularisation of Astronomy, which has been my lifelong aim. I would also like to thank the various presenters, past and present, of BBC Radio York, for letting me have regular night sky slots since the Radio Station began, many moons ago. A 'thank you' also to the other local radio stations, who put up with me, particularly when I forget what I was talking about, having gone off at a 'tangent' (= digression). These include: Yorkshire Coast Radio and Radio Scarborough, BBC Radio Leeds, Radio 5 Live, and Radio 4. A special thanks to Trish,the producer and Paul Hudson for giving me a seasonal 'slot' on Paul's 'Weather Show', which is broadcast over a number of neighbouring local BBC radio stations. My thanks to you all! I reserve a special thank you for the late Senior English Master, at Normanton Grammar School, Mr T Hewson, who made me stand up in class during English on Tuesday afternoons, and read aloud several pages of Gulliver's Travels, despite the difficulties I had in reading words. Thanks to him, I can now read properly and he taught me confidence to be able to share my love of Astronomy with all to whom I am invited to speak and teach. 'MOON MAGIC' --- A poem by Pamela Tennant (I learned this, as a junior school child, at the Church of England Primary School in Normanton, West Yorkshire, England. Changing the Willows beyond the stacks, to Little old men with crouching backs. My interest in Astronomy began as a child, when I saw the feature called 'The Man in the Moon', for the first time (so I am told!). Several years later my father bought me a book called 'The Starry Heavens' by Ellison Hawks F.R.A.S., followed a Christmas later by another book, 'Introducing Astronomy' by J.B Sidgewick F.R.A.S.. With this book and a torch, I went out at night and looked at the starry skies to identify the constellations, and learned, with delight, the stories of these 'Star Patterns'. Then on Tuesday nights, around 7.30pm , after rushing through my Normanton Grammar School homework, I listened with great excitement to the serial dramatisation of Charles Chilton's novel ' 'Journey Into Space --Operation Luna! ', Around the same time, on BBC's Children's Hour, there was the dramatisation of 'The Lost Planet' series of books, written by Angus McVicar, which told of an expedition to Hesikos, the peaceful planet, where the flowers known as 'Charity', bloomed in profusion. these two launched me, well and truly, to the stars! My journey had begun! After being a member of the Batley and Spenborough Astronomical Society for a number of years, during the time I had my first teaching post at The Cathedral City High School in Wakefield (West Yorkshire), I started the school's astronomical society. Ten years later in 1975, I came to Scarborough, as Head of Religious Studies at Scalby School and founded SCARBOROUGH ASTRONOMICAL SOCIETY, because I discovered that there wasn't one; although later, I found that in the past, the Scarborough Philosophical Society had an astronomy 'branch' for a while. I am a Fellow of the Royal Astronomical Society, a member the British Astronomical Association and the Society for Popular Astronomy. These are the three main national astronomical societies. As a member of the Society for Popular Astronomy, I became the Director of the Occultation Observing Section, and introduced the observing and timing of asteroidal occultations. When I gave up that post, because of optical problems, I was honoured by the S.P.A. who made me a honorary life member. Now, as one of Pamela Tennant's 'little old men with twisted knees', I do my best to observe from my observatory in the 'back yard'. Together with the members of Scarborough and Ryedale Astronomical Society, I try to give opportunities for people to look at the night sky when special events take place, beyond our atmosphere; and, of course, to produce these 'Skynotes' in the hope that they are of some use to those who like me, a long time ago,.... go out on clear nights to discover, as I did, the wonders of our night skies. In these ways I am able to say 'thank you' to my life long hobby of Astronomy, which, in my opinion, is the noblest of all the sciences! 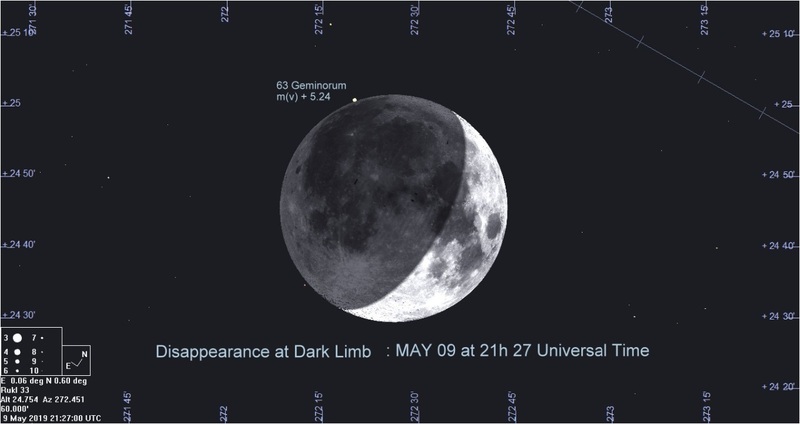 Moon's Celestial Position - APRIL 21 at 23h UT. 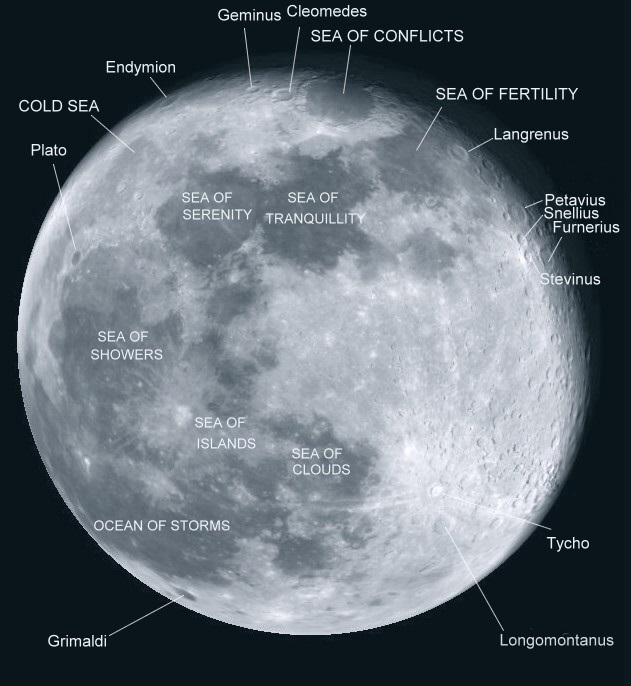 KEY to the LUNAR FEATURES. FULL MOON was on Friday, APRIL 19 at 11h 13 UT. 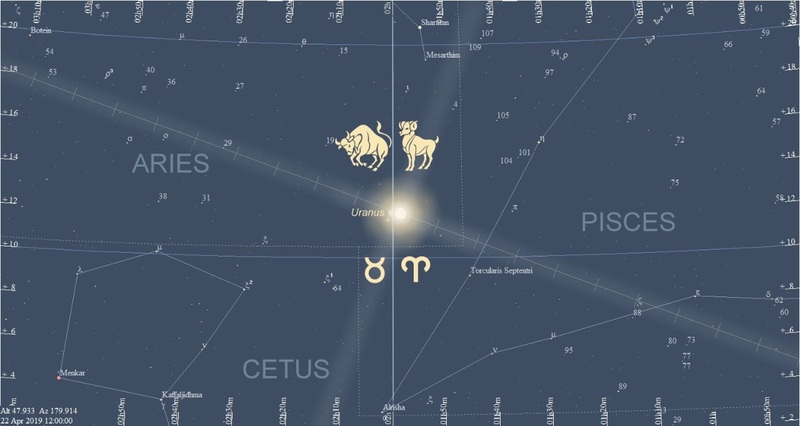 SUN'S CELESTIAL POSITION at 12h UT on APRIL 22. CELESTIAL POSITION : in ARIES. NORTHERN HEMISPHERE'S VERNAL EQUINOX was on MARCH 20 at 22h 00m UT. The SUMMER SOLSTICE is on JUNE 21 at 15h 55 UT. 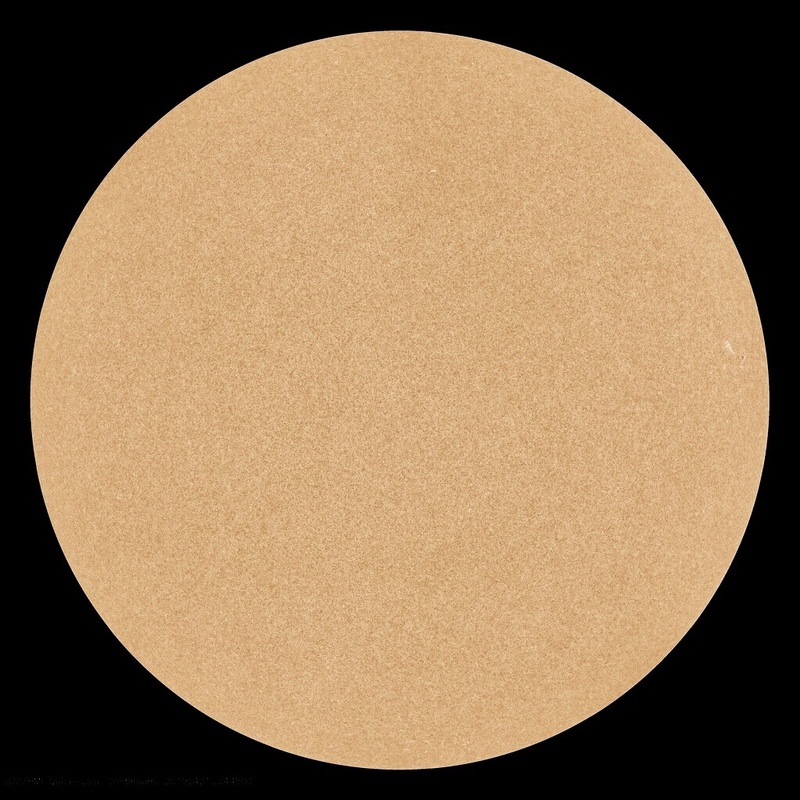 REMEMBER ------- NEVER LOOK DIRECTLY AT THE SUN unless you have the proper astronomical filters for the purpose, NOT the one often provided by the telescope manufacturer. IT IS SAFER TO PROJECT THE SUN'S IMAGE ONTO A SCREEN. Never look through view finders at the sun. instead look at the shadow of the instrument on a card. When the shadow is as small as it can be, it is pointing towards the sun, and you will see the safe image of the Sun on the card. NEVER LOOK DIRECTLY AT THE SUN------ IT CAN BLIND YOU ! The times when ALGOL (Beta Persei), the famous eclipsing variable star reaches its MINIMUM brightness may be found in the monthly SKYNOTES summary for each month. The star has a page dedicated to itself also, accessible via the MENU above. 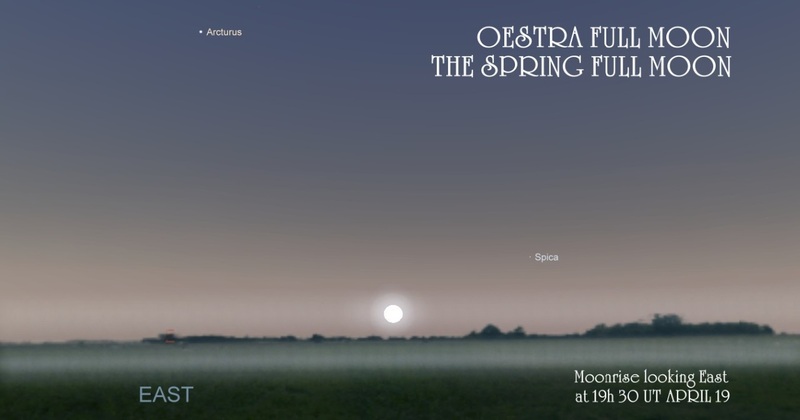 ASTRONOMICAL EVENTS due this month may be found in the MONTHLY SKYNOTES, accessible via the MENU above, and on the supplimentary 'FRONT PAGE', see above. JUPITER'S GALILEAN SATELLITES. 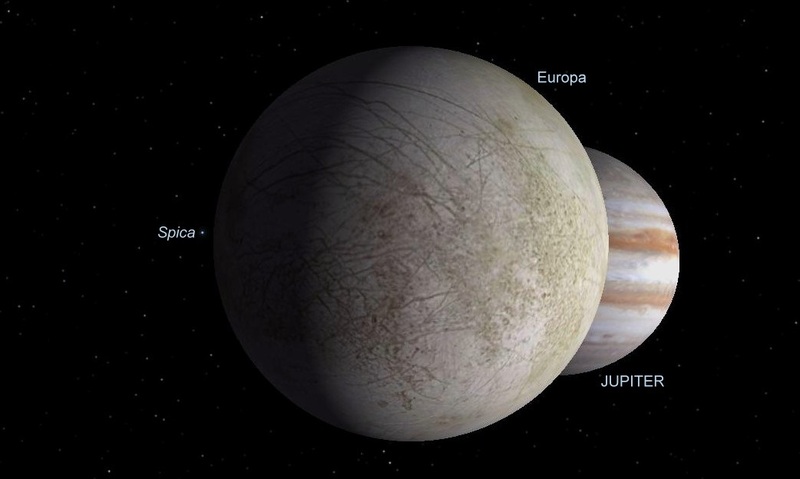 Their daily changing configuration in relation to Jupiter. The daily configuration graphic may be seen below. 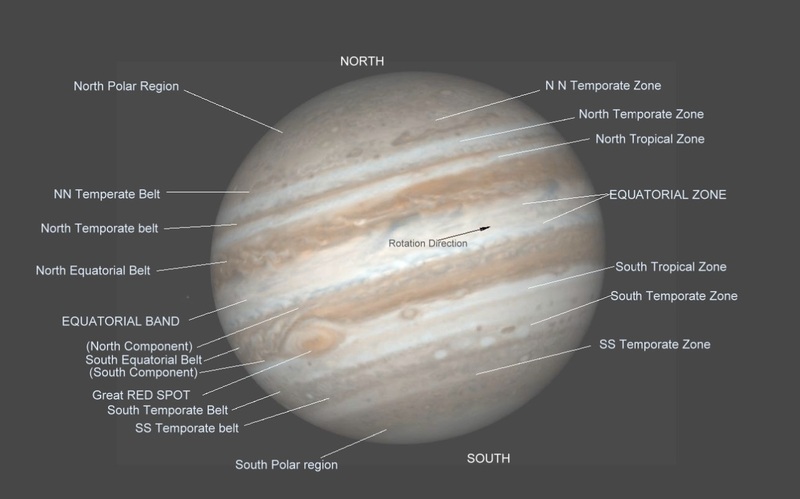 The zones and belts of JUPITER for reference. 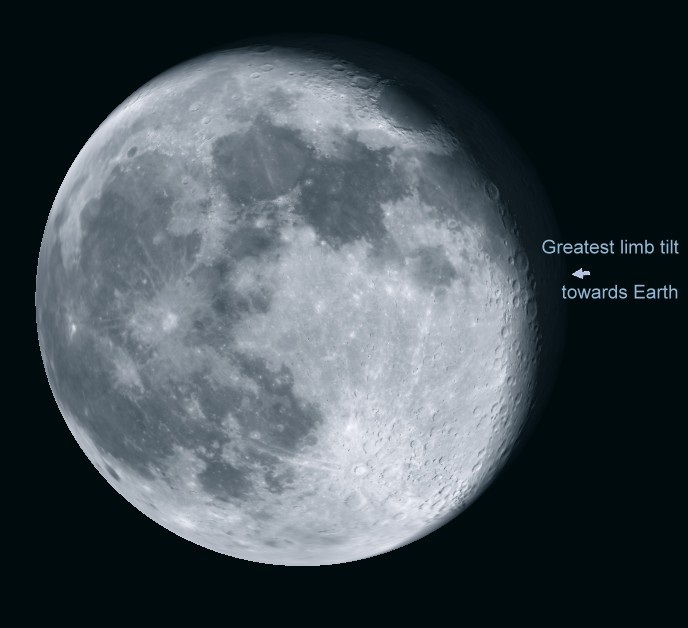 APRIL19 th FULL MOON ----- This is THE SPRING FULL MOON (EASTER FULL MOON) of our Anglo-Saxon ancestors. 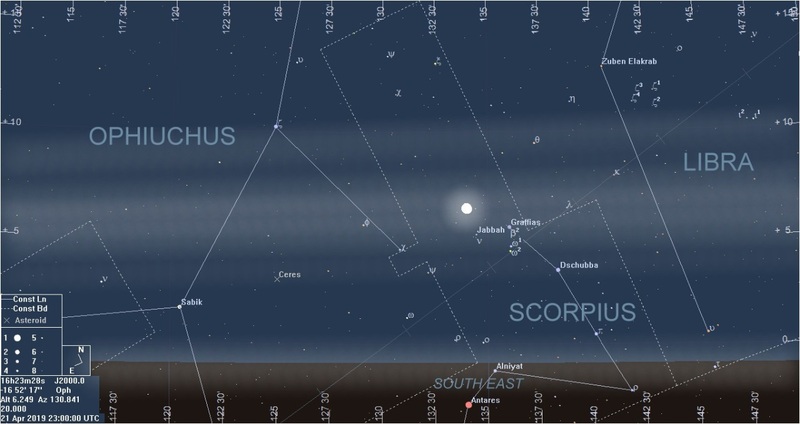 This illustration shows the FULL MOON rising on the Virgo/Libra border. The images on either side of these tables are of SCARBOROUGH, taken by residents of the town. They have kindly given me permission to show their work, for which I give them grateful thanks. They are all justifiably proud of where they live! 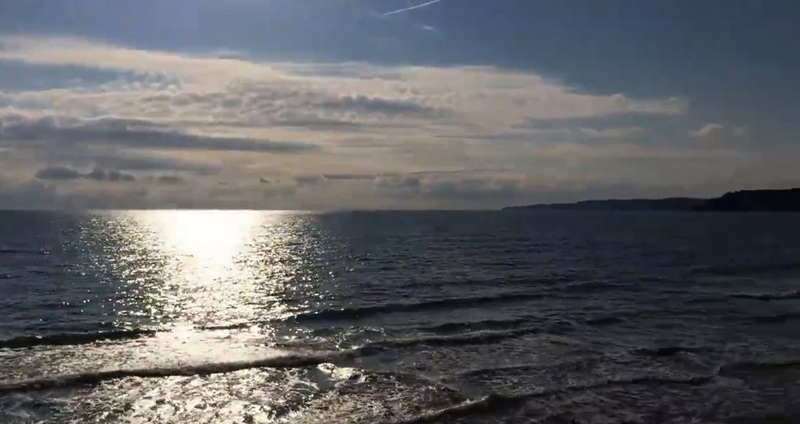 SCARBOROUGH NORTH BAY, EASTER, 2019: A beautiful shot looking towards the SEA LIFE CENTRE. Image courtesy of @FeelBetter2day Thanks Linda !